Event professionals work in one of the fastest growing, continuously changing, and just plain busy industries. Staying in the know – keeping up with the trends, desires, and ever-changing expectations of attendees and wearing a dozen different hats at all times – it can be a lot. 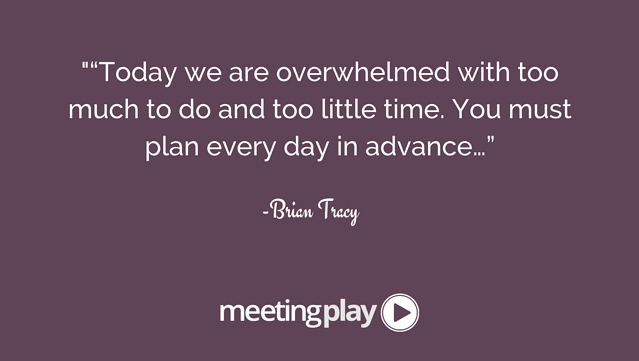 But internationally acclaimed motivational and time management expert, Brian Tracy has solutions that can help every event professional. Event professionals work in an industry and a career that is different from other professionals. Other professionals may be tasked with a typical 9-5 and specific job ‘job function’ or duty. Event professionals, however, can be expected to work all sorts of hours – long days and nights – when it comes to planning events and executing them. Before an event, and before your day, plan your tasks and charges. What MUST be done today, and what can be pushed down the list if it must? Event professionals should write down a list daily, and monitor their tasks and charges to ensure the goals are accomplished and/or modified. Brian Tracy is a huge advocate of tackling the most difficult task first thing in the morning – ‘eating the frog’ so to speak. The premise is ‘eating the frog’ is that if you do this first thing – odds are, nothing worse will come your way that day. Effectively – each task after eating the frog gets easier and easier. Event professionals don’t have the luxury of working in an industry that allows for much procrastination. Beyond, it seems every day there might be more than one frog to eat – but by beginning the day, when you have the most energy and mental alertness and tackling the most difficult/daunting task, event professionals are able to set their days up for success. No matter what you believe, you will be exactly such, argues Brian Tracy. Thus if an event professional holds a belief that their skills are not good enough, or that they are lacking, deflating, or even walk into an event thinking the mobile event app will fail - well just don't (especially when you're working with MeetingPlay!). He recommends you program into your subconscious that at which you desire to be great at, even if you aren’t. When people ask you, tell them you are! You have to start believing it so that you don’t hold yourself back and so that your subconscious can move you towards new results. The events industry is constantly evolving and changing. Event professionals have to keep up - and the only way is to always be learning. Whether in the air or traveling on a train, the weekends, or any spare 5 minutes available -it's absolutely essential to be staying on top of the trends, reading a case study - anything to master the expectations of event attendees. Working in the events industry is no easy feat - it takes a professional willing and dedicated to hard work, long hours, and consistent growth and development. However, the best event professionals find joy in the battle and the outcome of producing successful events! 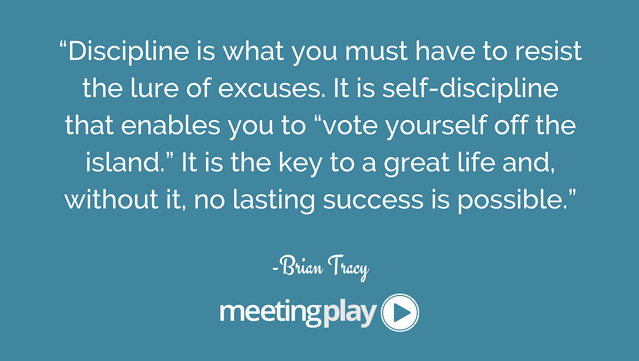 Hopefully, these tips from Brian Tracy help further careers and success!